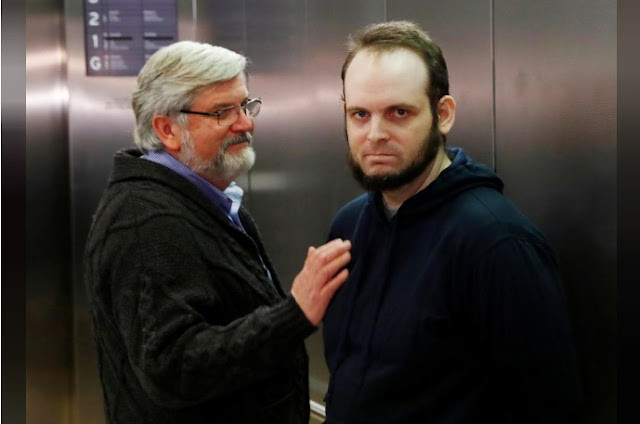 Joshua Boyle stands next to his father Patrick Doyle after arriving with his wife and three children at Toronto Pearson International Airport, nearly 5 years after he and his wife were abducted in Afghanistan in 2012 by the Taliban-allied Haqqani network, in Toronto, Ontario, Canada, October 13, 2017. OTTAWA/TORONTO - A U.S.-Canadian couple freed in Pakistan this week, nearly five years after being abducted in Afghanistan, returned to Canada on Friday where the husband said one of his children had been murdered and his wife had been raped. “The stupidity and the evil of the Haqqani network in the kidnapping of a pilgrim ... was eclipsed only by the stupidity and evil of authorizing the murder of my infant daughter,” Boyle said, reading from a statement, in a calm voice. Boyle said the Taliban, who he referred to by their official name - the Islamic Emirate of Afghanistan - had carried out an investigation last year and conceded that the crimes against his family were perpetrated by the Haqqani network. One of the children was in poor health and had to be force-fed by their Pakistani rescuers, Boyle told AP. Reuters could not independently confirm the details. A U.S.-Canadian couple freed in Pakistan this week, nearly five years after being abducted in Afghanistan, returned to Canada on Friday where the husband said one of his children had been murdered and his wife had been raped.